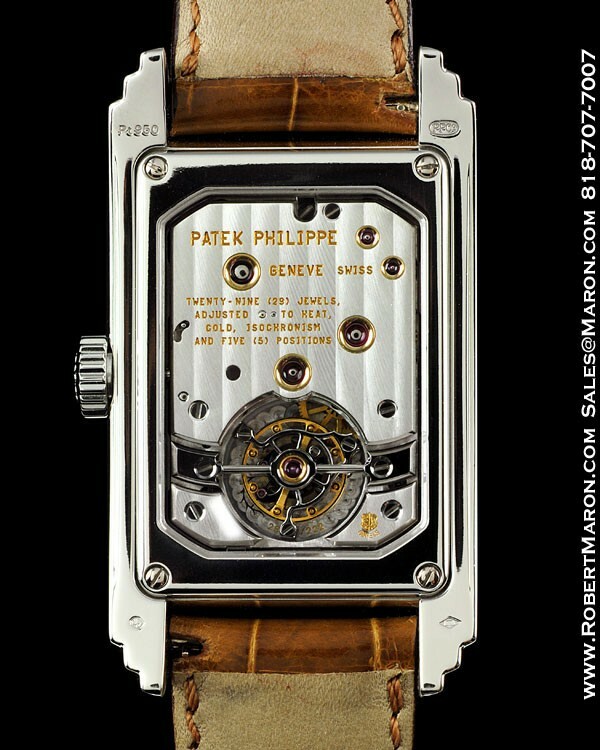 The Patek Philippe 10 day tourbillon is one of the hallowed Swiss firm’s most coveted watches. 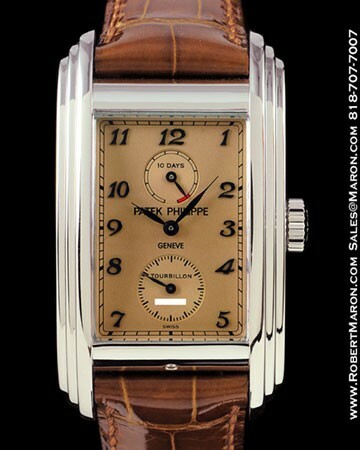 It is by far one of Patek’s most imaginative watches and is an uncontested watchmaking Tour de Force. The platinum rectangular case has an Art Deco feeling to it, with its triple stepped case sides. Case dimensions are 30mm wide by 52mm long by 12mm thick. The front and display back crystals are sapphire. 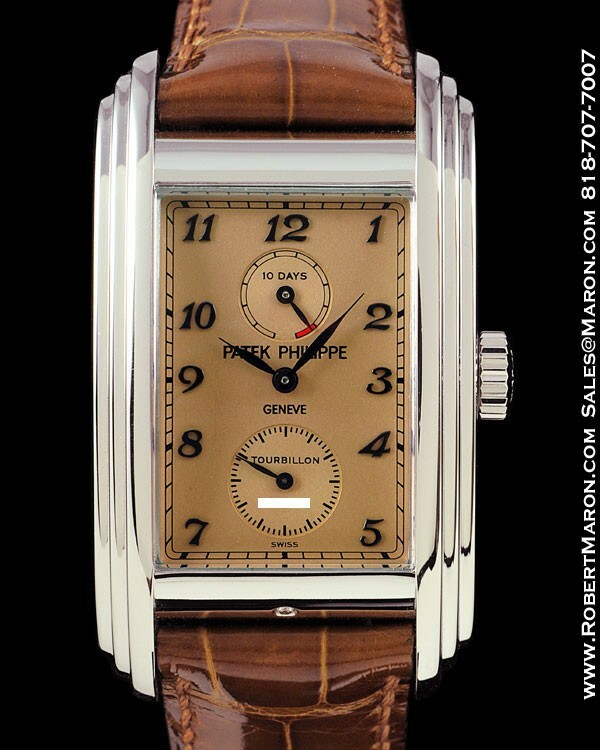 Patek’s signature Top Wesselton diamond is set into the case between the 6 o’clock lugs. 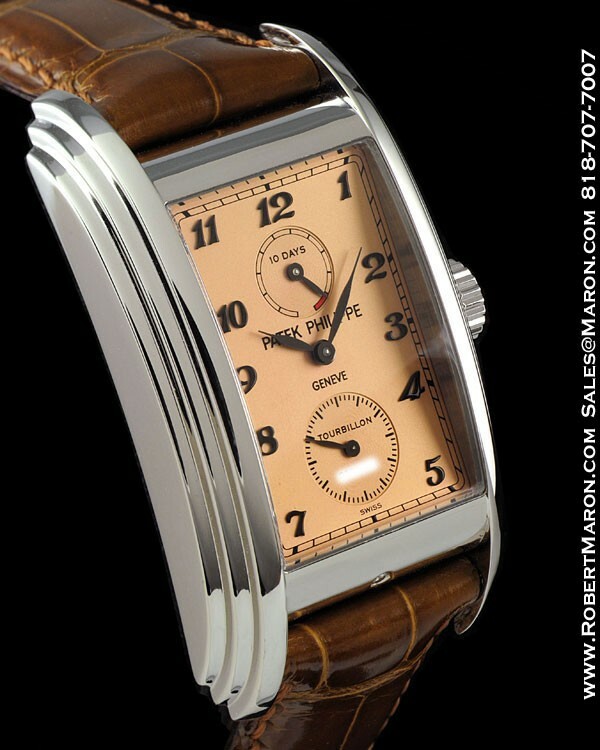 Dial is salmon colored with applied blackened Breguet numerals and blackened Feuille style hands. There is a power reserve indicator beneath 12 o’clock and a subsidiary seconds dial above 6 o’clock. “Tourbillon” and the movement’s serial number are printed on the dial. As nice as the case and dial are on the 5101, it’s the movement that truly shines. First of all, it’s a formed movement, which is the old school approach of using a rectangular movement in a rectangular case. To achieve the power storage capacity to accomplish a 10 day power reserve, the master watchmakers at Patek Philippe came up with a double mainspring/double barrel system. That, in and of itself is impressive… but in a rectangular case it’s next to impossible. As if that weren’t enough innovation for one caliber, Patek decided to really demonstrate their prowess by also building a one minute tourbillon into this remarkable Caliber TO 28-20/222. The tourbillon cage is not visible from the front of the watch, as so many are, because the lubrication that Patek decided to use for this movement is sensitive to light. It’s nice to know, which is made clear by this fact, that Patek is not a marketing focused company, but a watchmaking focused company – again, old school, and very impressive. The movement has 29 jewels, is adjusted to heat, cold and isochronism and in 5 positions and is stamped with the Geneva Seal. 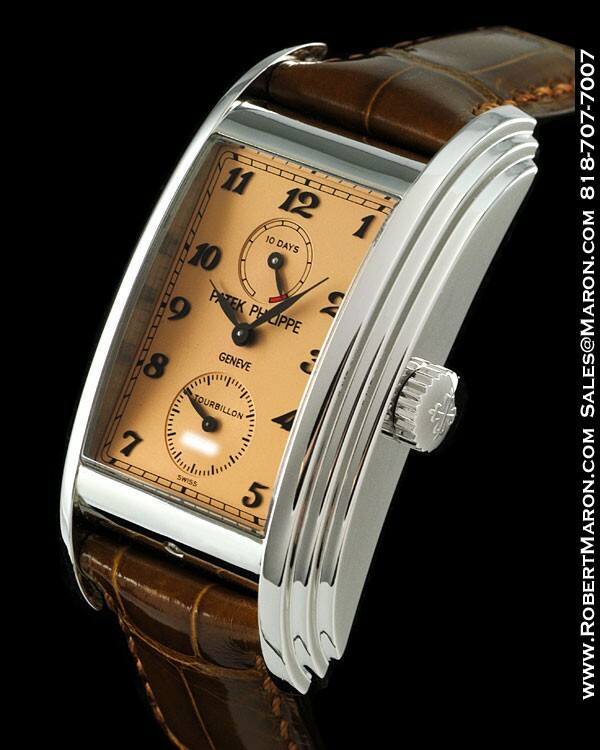 Strap is hand-sewn Patek crocodile with a platinum Patek tang buckle. Watch is indiscernible from new with box and large format papers.